Welcome to Loft by the Lighthouse. 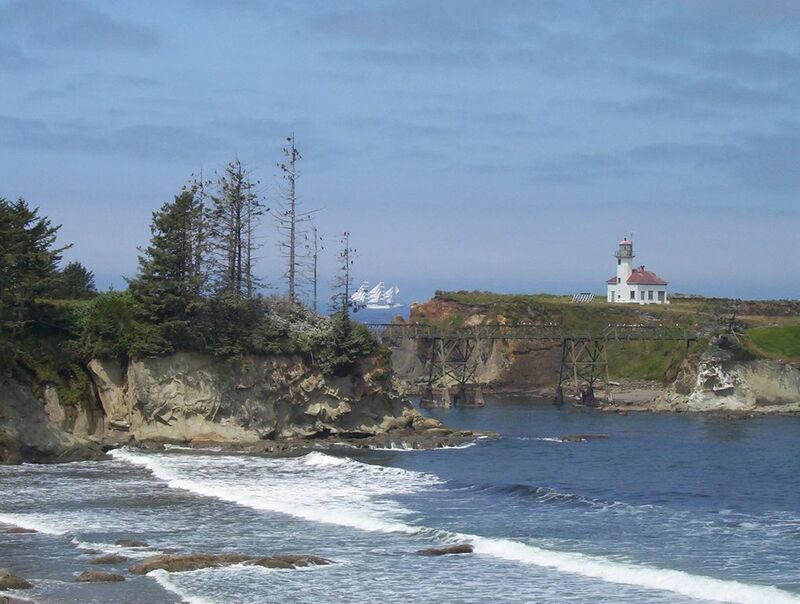 You are greeted by the beautiful Pacific Ocean and the Cape Arago Lighthouse. The Suite has a king size bed and most often pure linen sheets. The bedroom is arty with a mobile by an Ashland, Oregon artist. Also, there are ceiling windows that surround the room that expose the trees blowing in the wind. There is original art. We have private steps that access pristine Lighthouse Beach. The beach is perfect for beachcombing, surfing, fishing, bird watching, whale watching and photography. The large deck is a favorite as the view is panoramic of the Pacific Ocean, Cape Arago Lighthouse, Coos River Bar opening, and the Sand Dunes. Catch all the barges, fishing boats, freighters and pleasure boats crossing the bar as you relax on the private deck. Keep on the lookout for kayaks from famous Sunset Beach, and surfers on Lighthouse Beach. If golfing is a favorite, Sunset Beach Golf Course is less than a mile away. We have complimentary golf clubs too. Bandon Dunes golfing is about 17 miles away. We are located in the Cape Arago State Park, so it is about 1.5 miles from Shore Acres where the big waves hit the sea wall. Fun, Fun, Fun. So, this a favorite respite for the adventurous couple or the tired twosome. Welcome! Don't miss the annual Shore Acres Holiday Lights. Light show starts Thanksgiving and runs through New Years. Spectacular view of the Cape Arago Lighthouse and the Pacific Ocean. Beachfront with private steps to beach. Oceanfront with private steps to beach. small course nearby, Bandon Dunes courses about 30 minute drive. Large private deck with panoramic view of the Pacific Ocean from the Cape Arago Lighthouse to the Oregon Dunes. Watch numerous ships and boats journey over the Coos River Bar. Solid steps with railings to the beach. The view from both the suite and deck are stunning, and it was wonderful to listen to the waves, which were easily audible by cracking a window. You can walk down the stairs to Lighthouse Beach which rarely had anyone on it, plus it's only 1/4 mile to Sunset Bay, with Shore Acres and Cape Arago State Parks just past that. The friendly hosts live next door and were readily available, although the house itself feels private (one exception - see below). They provided treats in the frig and kitchen, as well as fresh flowers, a fruit bowl, and chocolate by the bed. The bed was comfortable with linen sheets, and the chaise lounge in the living area was a wonderful place to recline and look out at the ocean. Although I loved all of the above, problems with suite layout dropped my rating compared to similar sized homes I have stayed in at this price point. The suite is overcrowded with furniture, given the small size. For example, there is no path to the bedroom wide enough for a regular sized rolling suitcase. It was difficult to open the armoire (containing dishes and local information) without bumping into the dining table. The small kitchen area is not conducive to anything other than snacking. The microwave is small, and the bar sized sink made it difficult to wash anything larger than silverware or glasses. Counter space is minimal, and there is no dishwasher or oven. The small bathroom has a locked door leading to the main house, but it fits poorly so both sound and light leak through (I heard the hosts discussing breakfast while brushing my teeth). The shower has a large step, and is poorly lit. There is minimal space for your toiletries. None of the above would prevent me from staying again at this lovely location, but I felt they should be noted. Beautiful location. View of the ocean and lighthouse was amazing. The hosts are welcoming and the place was as advertised. Quiet, comfortable and clean. Close to walking trails, Charleston, and Coos Bay. The hosts thought of everything, breakfast food, coffee and wine. Thank you Jill and Paul. The view is divine, the beach walk easily accessible. Jill and Paul have made available their conscious, artful and comfortable loft. What a gift that was for me. They were so kind and welcoming and generous. The loft and the deck and grounds were so tastefully done. It was a wonderful experience to spend some time there and absorb the peace and quiet and fresh air. A memorable stay, indeed. Thank you, Jill and Paul. You wonder if you’ve made a mistake when you walk in. Can we really stay here? The decor is beautiful and welcoming; the location amazing. The hosts, kind and respectful. Truly a wonderful combination. Paul and Jill were great hosts. They provided us with a bottle of champagne, nuts, fruit, and muffins. Great location , great view, and your own private beach. Oceanfront with Cape Arago Lighthouse view in every room. Private steps to the beach to go surfing,fishing and walking. Spectacular scenery so bring cameras and kindles to enjoy the deck. View sand dunes and sunsets, and freighters and fishing boats while resting in the room or on the large deck. Please: two people, no pets. Maximum two guests. No pets.